Saint Benedict warns against forming unwholesome alliances and factions within the monastery. Such alliances and factions may be based on common ethnic or familial origins and loyalties. In every closed social environment there is a risk of persons being divided into the protectors and the protected, the bullies and the bullied; one hears of such things in schools and in prisons. 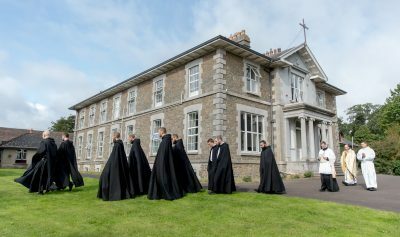 In monasteries where there happen to be uncles and nephews, brothers, and cousins, there may be a risk of the ties of kinship becoming a threat to the unity of the whole monastic family in which “the younger brethren reverence their elders, and the elder love the younger” (Chapter 63). The monastic family will find in the conclusion of Chapter 5 of the Epistle to the Galatians a description of the virtues that foster charity and unity in the monastic family. There is one thing only that always triumphs over the machinations of the devil, the sworn enemy of all charity and unity, and that one thing is humility. The smallest act of humility is enough to undo the worst diabolical strategy. It is enough for a brother to humble himself for the devil’s best laid plans to be thwarted. Whenever charity and unity are threatened, humility is the remedy. Whenever charity and unity are damaged, humility is the remedy. Charity and unity flourish in a monastery where the brethren vie with one another in taking the lowest place; where one asks for pardon and gives pardon without delay.